A carjacking suspect was fatally shot by police in San Francisco on Friday. Sergio Quintana reports. A San Francisco police officer fatally shot a carjacking suspect Friday in the city's Bayview neighborhood, an official said. Sgt. Michael Andraychak said the officer fired at least one shot at the suspect, who died at a hospital. The man was suspected of assaulting a California Lottery employee and stealing a van that belongs to the agency, Andraychak said. The has been identified by the San Francisco Medical Examiner's Office as Keita O'Neil, 42. 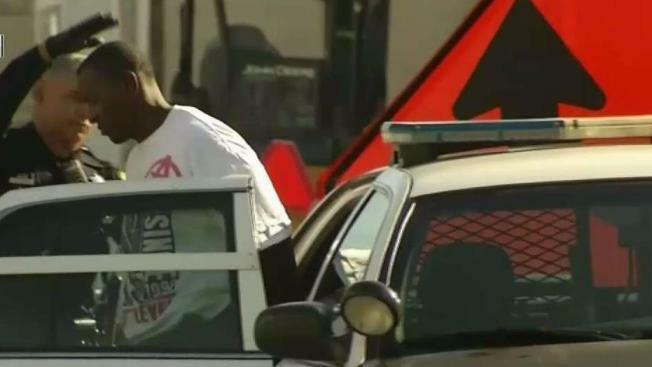 Four others in a SUV seen traveling with the stolen van were detained and are suspected of taking part in the carjacking. The suspects drove both vehicles to an area of public housing where the shooting happened, he said. A San Francisco police officer fatally shot a carjacking suspect Friday in the city's Bayview neighborhood, an official said. Thom Jensen reports. California Lottery spokesman Russell Lopez confirmed the stolen van belongs to the agency and said the employee is shaken up but that she was not seriously injured. Television images from the scene showed a patrol car with a shattered front passenger-side window and blood splattered on a side door. Andraychak said no officers were wounded and would not say whether the suspect fired a gun, saying it was too early to provide any other information. "Body cameras video needs to be reviewed, witnesses need to be interviewed, it is still very early on in the investigation,'' he said.